Once again, Bell Canada has made it the top of the Commissioner for Complaints for Telecommunications Services’ (CCTS) naughty list. 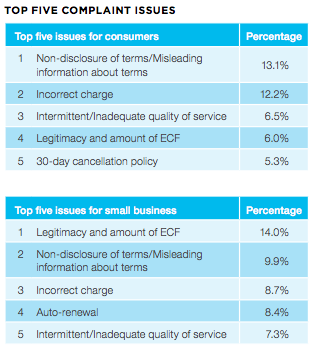 In its 2014-15 Report, Making the Tough Calls, the CCTS ranks Canadian carriers based on two important codes of conduct developed by the Canadian Radio-television and Telecommunications Commission (CRTC): The Wireless Code (TWC), and The Deposit and Disconnection Code (D&DC), both of which apply to domestic and small business services. In each case, Bell garnered the greatest number of complaints – 36 per cent of all complaints received, including 11 per cent of all TWC breaches and 52.6 per cent of all D&DC grievances – most of them related to incorrect charges and non-disclosure or misleading information about contract terms. Seeing Bell at the top of its list for yet another year marks a trend that the CCTS’s Commissioner and CEO, Howard Maker, says is cause for concern. Rogers once again found itself in second place overall with 18.2 per cent of the total complaints received (half that of Bell). However, unlike Bell, Rogers fared much better in the area of TWC breaches and D&DC grievances, scoring just 1.7 per cent and 0 per cent of all complaints in these areas, respectively. While both large carriers showed decreases in the volume of complaints received, it was Rogers who fared better: while the total received complaints about Bell dropped by just 1.4 per cent, Rogers’ complaints were down by a much more substantial 24 per cent, double the average decrease of 12 per cent. According to Maker, that 12 per cent decrease is not only good news, it’s a clear indication that, when they put their mind to it – along with their resources – Canada’s carries can make improvements. “What we see today working with Rogers is they put resources on it, they put focus on it, and they try to work with us,” says Maker. According to the report, of the total of 761 complaints logged by small businesses, most tended to focus on contractual issues. And of these, one of the most frequent complaints revolved around the issue of auto-renewal, a process whereby a customer’s contract is automatically renewed unless the contract was specifically cancelled (nearly 44 per cent of all complaints received from small businesses related to this problem). The most-complained about issues differ between consumers and business. For further details, and to learn more about the work of the CCTS, visit their website at www.ccts-cprst.ca.